My Uncle Pete was one of my dad's half brothers. He was considered to be the black sheep, if you will, from all my dad's brothers and sisters and there were eight of them. Pete left home at an early age if memory serves me right, around 15 or 16. He worked in the oil patch, bootlegged alcohol and later ran a pool hall. Pete had that "cowboy gene" in him the same way I did and still have. 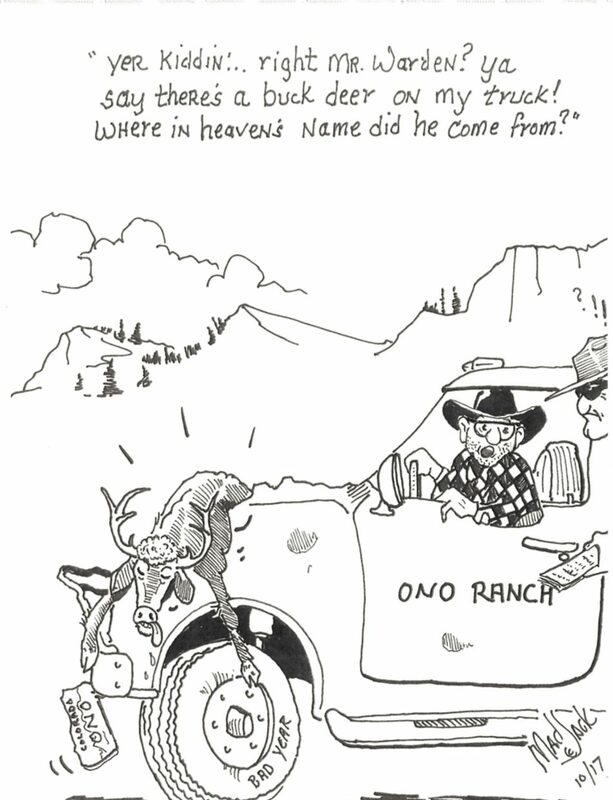 He, I don't know how, acquired a ranch in Arizona when he was a fairly young man. He later sold it and bought a ranch north of Sheridan, Wyo., across the border into Montana. Pete and his wife were not what you would call close to our family in any way. As years past, Pete gave his wife of some 20 years an option. Either her mother moves out of their home or her and her mother both go. They both left and took a considerable amount of Pete's assets with them. The old gal had lived under Pete's roof almost the entire time. So, here we are pulling into Pete's driveway to this three-story stone house surrounded by cottonwood trees and knee-high grass in the yard. Pete was expecting us but was not home at our arrival from Texas. We were met by a one-eyed woman with a 6-year-old kid and she claimed to be the housekeeper and cook. Pete lost one of his eyes striking a match to light a smoke in years past. What a pair this had to be. As it turned out, she was just the cook and housekeeper. Pete, in his 50s, was dating a barrel racer in her 30s who lived in Sheridan. As a 14-year-old lad who had never been to a real ranch before, to say I was impressed, well, would be just that, I WAS IMPRESSED! In the front room was a staircase with a stuffed Eagle mounted on the banister. There were no carpets, just hides from bears and mountain lions and steers. The dining hall had a long table where the cowboys and family were fed. Lucy Yellow Mule, a young Crow Indian girl, shared the small one-room bunkhouse with two cowboys. Lucy was a "looker." Things were beginning to take shape in my young inquiring mind. My brother and I rode horses, shot guns, traveled around the ranch with dad and Pete and saw all of the wildlife, plus a few trespassing Indians hunting deer. We later went into Sheridan to meet Pete's girlfriend (she had a pet skunk) and we went to one of Pete's watering holes. This bar was full of rodeo cowboys, smoke, lots of foul language and the most friendly folks I had met in a while. What a deal for a Baptist deacon's son to be involved in. I loved it. The last chapter of Pete's life, he married and divorced this woman, Ann, the barrel racer. He got in a card game in Sheridan one night, got pistol whipped, had a heart attack, sold the ranch and moved to Arizona to reunite with his first wife. Her mother had died, Pete was in a wheel chair and lived out his life with the first wife and a few horses in the corral.